A lot of clients have been asking for a list of foods that can help boost metabolism, and shed excess body-fat. 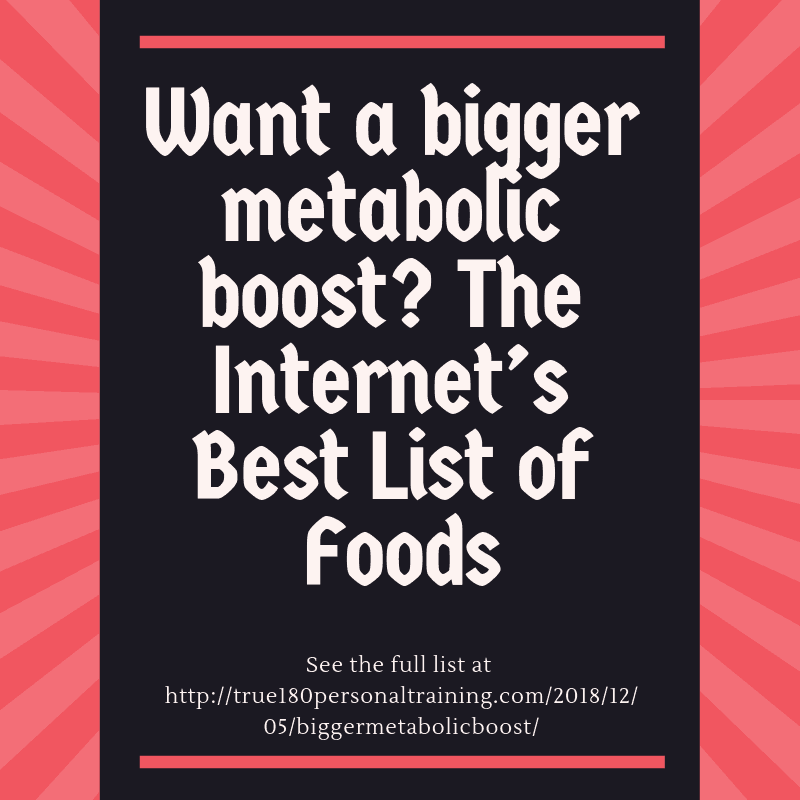 This is the Internets most comprehensive list of scientifically validated foods to boost your metabolism and burn body fat quickly and easily. Yes. This list is better than any other list on the Internet. Bar none. Before we get to the list I want to share one reason why our list is special: the foods on our list result in a net loss in calories. The easiest way to think about what “net loss” means is with a business metaphor: If a business spends $100 to increase revenue by $50 that’s a net loss – bad for business, but good for fat-loss. Unlike most lists of “metabolism boosting foods”, these items on our list will cause your body to burn more calories than it takes in. For example, you will see lean sources of protein on other lists because digesting protein consumes 20-30% of the calories in your protein. This is higher than any other kind of food, but you will still absorb the other 70-80% of calories in even from pure protein. Even though eating protein will boost your metabolism it still yields a net gain in calories, and, if eaten in excess these calories can still block fat-loss, or worse. The most common myths repeated on these fat-burning food lists are raw grapefruit and celery. While these foods are low in calories, and require a lot of work from your digestive system they still yield net positive calories. In other words, eating them still delivers more calories than it costs to digest. You may have noticed that this is a list of cold and very cold zero calorie beverages. Cold beverages require your body to burn calories to bring them up to body temperature. If that cold beverage has no calories in it, then it results in a net loss! You will burn 1 Calorie for every degree Celsius per liter of fluid. (Science is metric.) While you and I would like this number to be bigger, this is as good as it gets. Any list promising more is using the same strategy Bernie Madoff used before he ended up in prison. Want a bigger metabolic boost? The secret to boosting your metabolism is no secret at all. The same thing that legitimately boosts your metabolism also prevents/reverses osteoporosis and osteopenia, is the best treatment for hypertension, and so much more. It’s called strength training. It is even more important with age. Know someone who should read this? Help them out by emailing or texting the link, and/or posting to your favorite social media site. It’s selfish to keep awesome things to yourself.